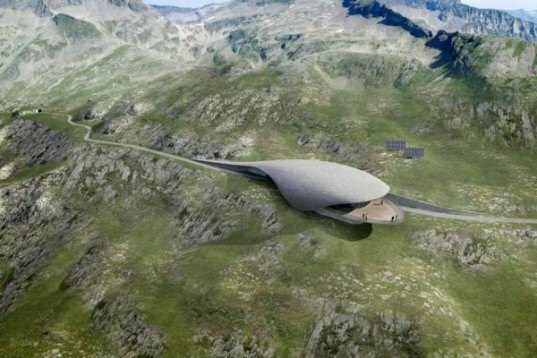 Architects Zechner & Zechner have won the Reisseck railway contest to construct an eco-friendly terminal high atop a mountain in Austria. 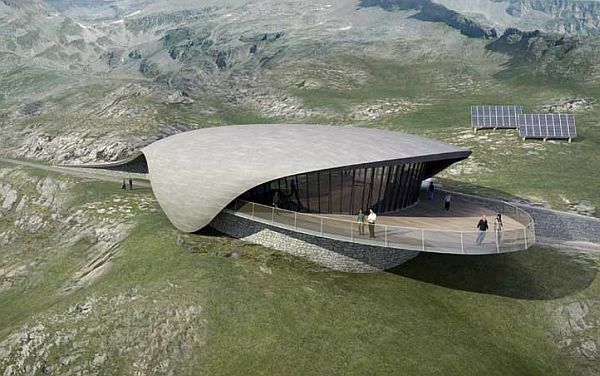 Emerging out of the landscape, the structure resembles a hooded snake with a gorgeous observation deck at its mouth and its curving body as its base. The terminal will also be equipped with solar thermal collectors for self-sustaining energy production. Due to its location almost 7,500 feet above sea level, large portions of the innovative building will be prefabricated and moved up to the site. Although it is funded by leading Austrian-based electric company VERBUND, an adjacent grid of solar panels will provide most of the power for the complex’s heating and hot water systems. The “hood” of the terminal will feature a restaurant with wrap-around windows and a giant observation deck, which provides incredible panoramic views of the surrounding mountains and lush vegetation. The sloping roof and deck are made from sustainable wood, and provide protection from wind and snow, while being unobtrusive to the view. Zechner & Zechner will also install large banks of reflective glass on the exterior of the building to further highlight and reflect the views. The new Reisseck terminal will be an oasis-like respite for travelers to enjoy a good meal while taking in views amidst the beautiful surrounding mountains. In the aerial image near the end of the copy, the structure looks like a sperm with a wicked under-bite. It will be better to have those solar energy collectors to be incorporated in roof rather to be standing alone. Due to its location almost 7,500 feet above sea level, large portions of the innovative building will be prefabricated and moved up to the site. Although it is funded by leading Austrian-based electric company VERBUND, an adjacent grid of solar panels will provide most of the power for the complex’s heating and hot water systems. The “hood” of the terminal will feature a restaurant with wrap-around windows and a giant observation deck, which provides incredible panoramic views of the surrounding mountains and lush vegetation. The sloping roof and deck are made from sustainable wood, and provide protection from wind and snow, while being unobtrusive to the view. Zechner & Zechner will also install large banks of reflective glass on the exterior of the building to further highlight and reflect the views.